Oh BABY!!!!!!! : Pregnancy Must Haves!!!! I know WAY too many people that are pregnant right now and I like to help as much as I can with things that I loved...and hated...while I was pregnant with Aiden. I was nauseous for the COMPLETE first trimester of my pregnancy and the smell of cooking food made me sick to my stomach. So everything I ate was cold...well just about. I LOVED spinach salads with grilled chicken breast, mushrooms, green onions, tomato's, cucumbers and croutons!!!! OMGoodness I am getting hungry just typing that!!!! I also ate a lot of peanut butter toast. There are TONS of good proteins in peanut butter and I was told that one of the reasons that you may be nauseous in the first place is because you are hungry and your blood sugar is getting low. I always had almonds, pistachios, and peanut butter crackers in my car for snacks and drank LOTS OF CHAMOMILE TEA!!!!! One thing that was a MUST HAVE for me was my Leachco All Nighter Pillow!!!!! Now let me just say that if you DO NOT have a king size bed your significant other will not be able to sleep with you and the pillow. Even with the king size bed it will be a struggle. But you will sleep like a baby!!!! 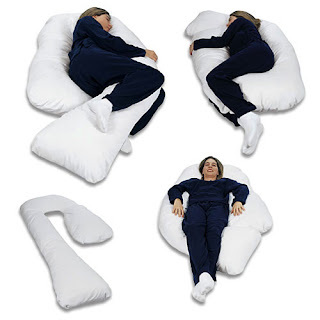 This pillow wraps completely around you and between your legs. So it has tummy support and back support (I normally sleep on my back so I HAD to have something preventing me from doing that). Like I said earlier...this pillow is not something small and compact but it SAVED me from any extra back discomfort at night. And if I had to travel anywhere via car for an overnight trip this pillow went with me!!!! I could not sleep at night without it!!!! I also could not sleep without my heating pad!!!! I got mine from Walgreen's for $15.99 and it has an automatic shut off so you don't have to worry about any fire hazards. One thing that I splurged (kinda) on, around month 4, was a GREAT pair of essential jeans. I am a jeans kind of girl and just could NOT wear my non maternity jeans anymore...and believe me I tried. So one day while I was in Mimi Maternity and tried on a pair of jeans that had the Secret Fit Belly!!!!!! Oh My Goodness...it was like heaven!!!! My tummy felt so GREAT and I don't think that I took the pants off. I do believe that I wore them out of the store. They were about $118 but I DEFINITELY got my wear out of them because I wore them ALL THE TIME!!! If you go to Destination Maternity you can see that they have the secret fit jeans from $35-$250...so there is something for every one's budget. Another piece of clothing that was a staple during my pregnancy were my VS Boyfriend Pink Pants!!!!! I think I had 6 pair and they were SOOOOO comfortable to just wear around the house, to the grocery store, nail salon (for that required pedicure), or ANYWHERE else!!!! I believe that I may have talked about this in a previous post but my feet were swollen a lot while I was pregnant. Normally I would wear 4 inch heels to work and out for dinner or something. But I became the flats queen while I was pregnant. And since most of my pregnancy occurred in the warmer months of the year, flip flops were my best friends!!! 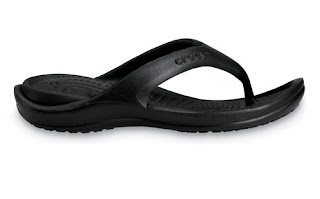 But not just ANY flip flops...but Croc Flip flops!!!! It was like walking on air!!! I wore them EVERYWHERE...and with ANYTHING...I didn't care if it matched or not!!! Now they have a lot to choose from when it comes to the Croc flip flops, but when I was pregnant they really just had the Athens line. I will be getting a new pair this spring in one of the more fashionable lines...lol. I already did a post about the fabulous Croc Mammoth's that I wear in the winter (got these during the pregnancy as well)...thanks Natalia!!!!!! Those are the MAIN items that got me through my pregnancy comfortably and I would not be able to do it again without those items...lol.